As an opening paragraph for a sales brochure, this probably struck a somewhat unusual note in 1978, but forty years on, it seems wholly otherworldly. But if we can accept the principle of the past being a foreign country, then we can in this case reasonably conclude that the country in question is located in the Scandinavian kingdom of Sverige. And while Sweden’s post-war non-aligned politics and permissive culture may have informed Saab’s attitude towards matters of social responsibility, it was its Northern European location, where 15% of the landmass lies within the Arctic Circle which both formed and dictated the Saab-Scania industrial group’s technical ethos. Of course, what this entailed was a range of vehicles ideally suited to a very specific set of environmental and user requirements, yet Saab, largely through one model in particular, managed to convince increasing numbers of buyers across Europe and the US of their virtues almost despite this. In the Autumn of 1978, Saab introduced the 900-series, billed as an entirely new range of more upmarket cars, to sit above and complement the existing 99 range. Saab could not afford an all-new model and their ethos dictated gradual evolution over reinvention anyway, so while the 900 was based on the platform and bodyshell of its well-regarded forebear, it was longer overall, wider across the body, with its wheelbase lengthened ahead of the scuttle, both to improve stability and crashworthiness. Additionally, the nose was lowered, with a bigger, lower mounted windscreen, which retained its unusual curvature both for aerodynamic reasons, but also to provide maximal distance from occupants in the event of a collision. Technically, the 900 retained the 99’s double wishbone front suspension design, with pivot mounted springs, while the rack and pinion steering, with collapsible column was located further back in the engine bay for protection. “As far as we know, no safer steering system exists”, Saab confidently stated. Rear suspension while of similar design consisted of a new ‘unsplit’ beam axle, with two trailing and two leading Watts links and a Panhard rod – Saab claiming advantages of light weight and low unsprung weight. With wider wheel tracks at both ends the changes were aimed at improving stability and providing more consistent road behaviour under all conditions. Inside the more commodious cabin, a new design of instrument panel, mounted on an energy-absorbing frame consisting of just five parts, brought a new level of clarity and ergonomic logic. The instruments and switchgear, all grouped close to the driver, placed safety, lack of driver effort and ease of use above aesthetic concerns. The major push upmarket however came with the Turbo model. Previously seen in the 99 body the previous year, Saab’s exhaust-driven Garrett AiResearch blower combined with a charging pressure valve (or wastegate) provided mid and high-range power outputs from 2.0 litres commensurate with that of a larger capacity 3.0 litre power unit. Originally marketed as something of a halo model, the installation into the 900 saw it as more of a suave, lavishly equipped range-topper. Of performance there was an abundance, the 900 Turbo developing 145 bhp, with Motor magazine recording a 0-60 time of 9.3 seconds in a 1979 test, ahead of larger-capacity rivals. However, the down side was noticeable turbo ‘lag’ and a somewhat peaky power delivery. The glamorous Turbo however, provided not only a performance boost, but the image Saab hoped for; certainly, through the 1980s, Trollhatten made much of the Turbo’s performance and putative aviation synergy, one which played well with the ‘Top Gun’ generation. However, it would be the more demure versions which would make up the bulk of the 900’s sales and arguably its raison d’être. Stylistically, the 900 reprised that of the 99 model, but was given a lower, more penetrating nose and distinctive 5-mph impact absorbing bumpers. Sharing door pressings and several other body panels aft of the A-pillars, the Bjorn Envall supervised design retained the Saab ethos of practicality and aerodynamic logic over fashion or frippery. Pretty it was not, with several UK publications going as far as to describe it as ugly. 1980 saw a three volume saloon added to the range. Throughout the decade, the range was further broadened, as the 99 was phased out. 1985 saw the introduction of a convertible version, while two years later, the nose treatment was revised. More power was also extracted by dint of 16-valve cylinder heads but until its ultimate demise in 1993, the aesthetics remained largely unchanged. Over a 15-year lifespan, more than 900,000 were built. Owing to its lengthy production run; the basic silhouette dating back to 1967 and the initial concept to a Sixten Sason styling sketch from the late 1950s, the 900 became so embedded within the Saab iconography that its 1994 NG 900 replacement was very much a stylistic cover version. Unfortunately, owing to its Rüsselheim parentage, it was, technically speaking at least, a pale and somewhat disappointing shadow of its forebear. In a similar manner to how the eternal Nunelfer defines Porsche, the Golf defines VW, or indeed the XJ once came to symbolise Jaguar, the 900 will forever remain the essential visual and emotional shorthand for Saab, especially now that the carmaker is no longer with us. But more than this, the original 900 also defined the marque both in engineering fitness for purpose and socio-demographic terms. A long-life car, in every sense of the term. Is there a finer epitaph? As Eóin states, the 900 was and remains the definitive Saab. It became more than merely a car and represented an attitude to car ownership and use that was concerned with safety, utility and longevity rather than style or speed. I don’t recall ever seeing one driven badly or aggressively, not even the turbo. The GM-era Saabs were poor facsimiles of the Ur-Saab, even if the first 9-5 was a decent enough car. It’s a shame that the last 9-5 was killed off prematurely with the demise of the company. I would love to buy one of those second-hand, but would worry about parts availability, particularly unique body panels and trim parts. I saw the estate in Trollhattan a few years ago. They really misses a trick by not making that. The 900 is also in my top ten cars I have to stop and look at. It never ceases to make me want to look at it closely. Isn’t the 90 the other way around, a 99 front end grafted on to a two-door 900? It is hard to tell so I’m not 100% sure! From what I can gather the 90 was a bit of a crossbreed, employing a 99 bodyshell, but 900-style body panels aft of the B-pillar. As such its boot capacity was larger, but it retained the earlier car’s shorter wheelbase. It more or less replaced the 99, which was discontinued around this time and was intended as an entry level model. It was only made as a two-door saloon, with the least powerful version of the slant-four 2.0 litre engine. Production ceased in 1987, giving the 99 a putative 20-year lifespan. It’s quite a pleasing looking thing, wouldn’t you agree? Forgive my ignorance – what does the “ur” prefix mean? Hi John, “ur” actually means “original” or “earliest”. I’m afraid I have rather lazily misused it as a synonym for “definitive”. Speaking of lazy misuse – in my defence, the use of ursprünglich in the article headline was intended to be a clever play on the mythical ur-Saab – the original much-referenced 92 model. Allegedly, the Combi Coupé version of the 99, which was launched, I believe in 1975, came about as an alternative to an estate version which had been built as a prototype at Trollhatten, but was subsequently hidden under a dustsheet, never to be revealed. According to Saab Marketing Director, Goran Hagstrom, speaking with Car’s Ian Fraser that year, it was felt at Saab that an estate would be perceived in the home market as a vehicle for tradespeople, and Saab wanted a more aspirational image. One would therefore assume that if you required an estate, you purchased a Volvo. It may also have been a case of there being a gentleman’s agreement between the two carmakers not to step upon one another’s toes, so to speak – something which was quite common within the European motor industry well into the 1980s. Before the 900 the 92-to-96 seemed to be the definitive Saabs. I remember holidays in Denmark in the Sixties where at least one out of three cars was such a Saab with the 95 estate being particularly popular. The difference in width between 99 and 900 is one centimetre. This is within manufacturing tolerances and the cars could be be dimensionally identical. The area comprising front suspension mouting points, front footwell and bulkhead is the most difficult to engineer and the most expensive to develop of the whole body in a car. This area is larely defining the stiffness and therefore the crash worthiness and torsional rigidity of the body. Any changes to the sheet metal in that area are really expensive. Shortening the platform is easily done by simply cutting some panels to a different length. 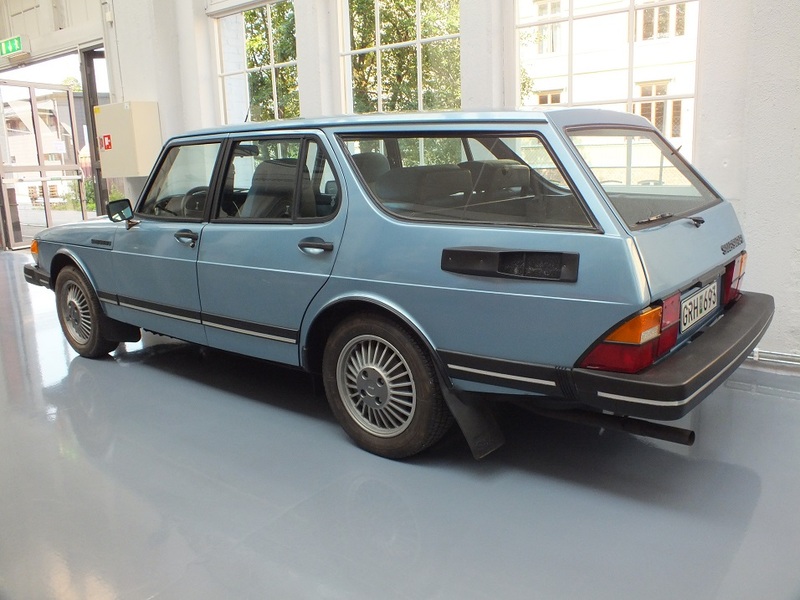 Lengthening it in the worst case involves welding together two differently trimmed panels like BMW did with the long wheelbase E3. Both steps do not involve any changes to the bulkhead area. There’s some coloured technical drawings on the 99 and 900 and you can clearly see how they essentially carved out an entirely new front end to the 900. It is most noticeble in that the front axle is moved forward with a substantial increase in dash to axle ratio. And it was indeed a very thorough and costly proposition with the biggest challenge being the a-pillar to wheel well mount. On the 99 there goes a reinforced steel hoop inside of the a-pillar that continues over the roof and all the way down to the other a-pillar and with a mounting point at the bottom of the wheel well, the car had essentially an in built steel cage already from the factory, and they wrapped the metal body around of that. And it took some effort to secure the crashworthiness in that as the mounting points had to be moved outside of that triangulation. I think it’s quite fascinating Saab took the extea effort in a time nobody outside Volvo and Mercedes had any thought in safety, and that extremely rigid front firewall made the Saabs virtually indestructible on the rally scene, most seen in rally cross. The 99 got its type approval for motor sport without the need for an extra rollover hoop/cage becaue its passenger cell was so increcredibly stiff in case of a flip over accident. The only other car I know achieving the same was the Stratos which is a completely different kettle of fish as a car specifically designed for rally sport. Something of a design icon, then, and the quintessential Saab. It would be wondeful if they had been able to continue it properly, rather than the flabby pastiche which was the GM 9-3. It then became a four door saloon, which is ridiculous. Sadly, Saab is gone, and Audi, BMW and others have moved into the upmarket fastback niche. My abiding memories of the original 900 are of an upright, commanding driving position, panoramic vision through the front screen, it’s slightly old-fashioned feel and most of all, a sense of being utterly planted on the road – even on really poor surfaces. They were very capable machines and hugely endearing because of it. Downsides were a notchy, narrow-gated gearchange, a rather austere looking cabin (unless one went Turbo), very high running costs and savage depreciation – the latter an abiding mystery to me. Old Saabs from 92 to this 900 looked the way they did because they were designed from the inside out and their looks were the result of a chain of thought and a certain engineering ethos. This ethos was diametrically opposed to whatever GM’s might have been. Therefore the Saapel Vectroid had to miss the mark anyway and the fact that the Vectra was crap from an engineering point of view didn’t help, either. Particularly not for a car from an engineering-led manufacturer like Saab. That’s much the same as Citroen’s fate, even if Peugeot was a much more honourable manufacturer than GM. Not forgetting the major drawback of the NG-series. The failure of the front bulkhead owing to stress cracks. This afflicted both NG 900s and 9.3s and was the subject of a major recall, I believe. My own example was rectified by Saab, prior to purchase but this must have been a serious loss of face (and status, one imagines) for the engineers at Trollhatten. The Vectra’s single biggest design inherited by poor Saab was that the steering rack was mounted to the bulkhead independently from the front subframe. This transmitted all steering reactive forces to the (not overly stiff) bulkhead, resulting in the cracks you mentioned. It also contributed to the steering rack moving up to two centimetres relative to the front suspension, which did nothig for steering precision as is easily imaginable. There were numerous Saab tuners offering retrofit stiffening brackets that connected the ends of the steering rack to the suspension turrets, greatly reducing this flex. Eóin, thank you for a great article on one of my favourite cars. I bought my first Saab, a 99 Combi Coupé in 1975; it followed on from a Fiat 128 and a 128 coupé but Mrs Mark was pregnant and sensible decisions had to be made. I was astounded by the solidity of the Combi as well as its sheer size. I was also delighted by the practicality of it; heated front seats, warm air demisting to the rear screen, enormous hatchback boot, the famous floor ignition key, an optional petrol can that fitted inside the spare wheel, hand brake working on the front wheels that could act as a crude traction control. The downside was a ride that on bumpy roads developed a cork screw motion and rapid nausea for passengers in the rear. Apart from safety considerations I bought the car for its appeal to my logic and indeed to my ego that it was a”thinking person’s” car. 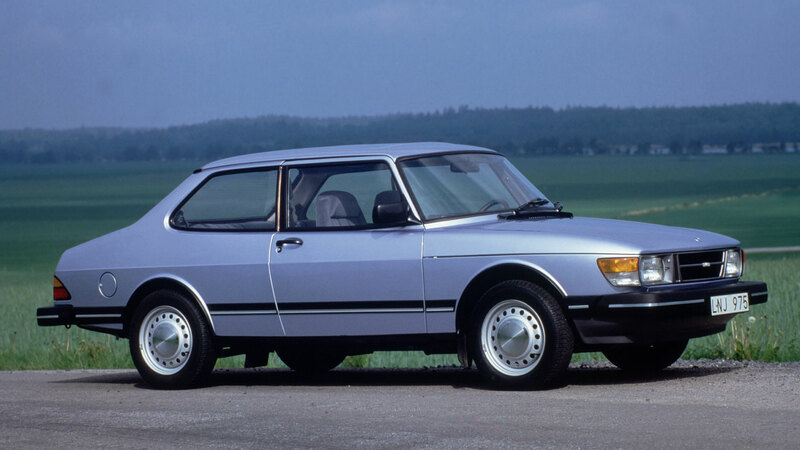 Next Saab was a 1979 900. The controls and dashboard were superb but it no longer had heated seats nor hot air demisting to the rear screen and I think the hand brake now worked on the rear wheels. The deep curved windscreen caused vision problems with rain being deflected on the side windows. Saab produced an after market fix of deflectors on the A pillars to direct airflow to the roof. I know you regard this as the ur-Saab but I think the Combi was the harbinger of the change of direction. By the way weren’t the colours of 70’s Saabs wonderful. My Combi was emerald green with green upholstery. Shamefully I followed with a navy 900 and a black GM900. The final GM 900 was simply the most unreliable and least pleasant car that I have owned. It had all the structural and handling deficiencies already mentioned plus a seemingly endless number of faults from head gasket to clutch. It was a sorry end to the relationship. Saabs were seen as cars for those interested in design and function, they appealed to engineers and architects; they occasionally appear in film or television as a signifier of that type of person and after its demise the role was probably filled by Audi. Is there a current car for that role or is the idea of such a car an anachronism clung on to by those of us old enough to know better? I hadn’t found DTW in 2014 so thank you for pointing me in the right direction for an answer to my question.